The New York Giants have the second overall pick in this year’s draft, a lot of people think that they should take Saquon Barkley, and a lot say they should take a quarterback. The fact is, Saquon Barkley may not even be available when the Giants pick at number two. 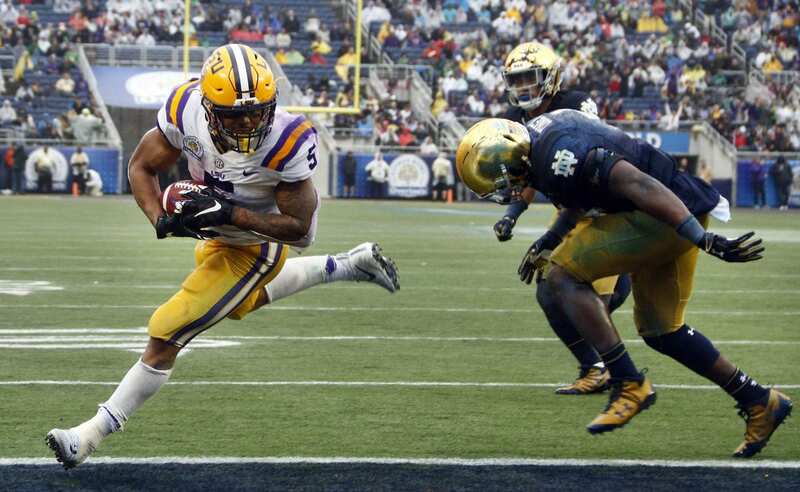 There are plenty of options throughout this draft that could help the New York Giants running game tremendously, and Derrius Guice is an obvious choice if available in the second round. The LSU running back had a tremendous 2016 season filling in for injured Leonard Fournette, starting 6 or 12 games and rushing for 1,387 yards and 15 touchdowns. 2017 was a little different for Guice as he fought through injury, but still managed to start 11 of 12 games and rush for 1,251 yards and 11 touchdowns. Derrius Guice provides exceptional balance, speed, and a violent running style that would have an immediate impact on any NFL team. These attributes compare with those of Marshawn Lynch, and when watching his tape I can see why. He is an aggressive downhill runner that can still make cutbacks and change direction at any moment. He will always fight for an extra yard at the end of every play and never shies away from contact. Injury is a concern, as well as the number of hits he absorbs. His pass protection and receiving needs improvement but shows the ability to grow in that aspect. There is concern that his running style may prevent him from being an every-down back. How would he fit in with the Giants? Many teams in the NFL are deploying backfields with multiple running backs with different running styles and is something the Giants have attempted to do in the past. With the recent signing of veteran Jonathan Stewart and Wayne Gallman coming off of his rookie season that showed promise. The addition of Derrius Guice could provide the versatility that could make this backfield deadly.